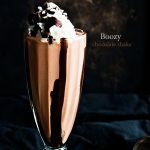 This Boozy Chocolate Milkshake Recipe is so creamy and delicious… you won’t believe what my secret ingredient is! I’m not good at this… the whole dealing with the loss of a friend thing. I’m just not. I tend to avoid life and immerse myself in everything but confronting the fact that a friend has died. 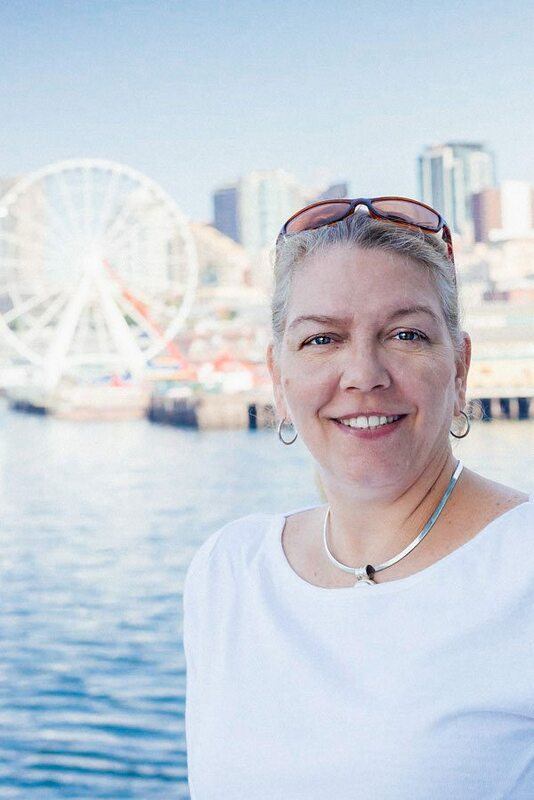 This past week, the blogging community has rallied together to remember a dear friend of ours, Joan Hayes. Joan was the southern voice and tremendous talent behind the blog Chocolate, Chocolate and More. Last Thursday evening, word began to circulate that Joan had been complaining of a stomach ache, laid down on her couch and simply never woke up. It seemed inconceivable to me that my vivacious and full of life friend could just be gone. I had chatted with her just a few days prior and she was her normal, cheerful, joking self. It turns out that Joan had suffered a heart attack. Friends, if you don’t click on any links in this post but one, make it be this. The signs of a heart attack in women are so much different than they are in men. Please read this to educate yourself so hopefully you’ll be aware of the signs of a heart attack if the situation arises. Joan and I were online friends who never met…and I have deep regrets about that. Earlier this year we were supposed to be on the same cruise and I had to cancel. Then this summer, my family vacationed on Tybee Island in Georgia. Joan is from Georgia and we had sent texts back and forth about meeting up on our way home as we passed through Atlanta. With a 17 hour car ride ahead of us, and 4 kids who were pretty much ready to be home, our meet up never happened. Then, earlier this fall my friend Mary invited me to a small retreat at her home that Joan was attending. It ended up being at the same timeframe my husband was running the Chicago marathon, so I wasn’t able to go. I wish I would have made time to actually meet Joan in person. One thing I’ve learned from this loss is online friendships, and I’m blessed to have so many, are a wonderful thing. I have a deep connection with so many people I have never met. I’m thankful to the internet for the blessings of friends all around the world. However, nothing, and I mean NOTHING, can take the place of connecting with someone in person. Friends, please take a lesson from my regrets…if the opportunity arises to meet a friend in person, do it. Go to coffee, meet for lunch, heck…stop at a gas station for a quick hug if you have to on the way through town. Just do it! I’d love for you all to get to know the Joan we all knew a little better (although she was an extremely gifted blogger…I am sure most of you knew her already!). Mary has pulled together all the tribute links we’ve written for Joan. 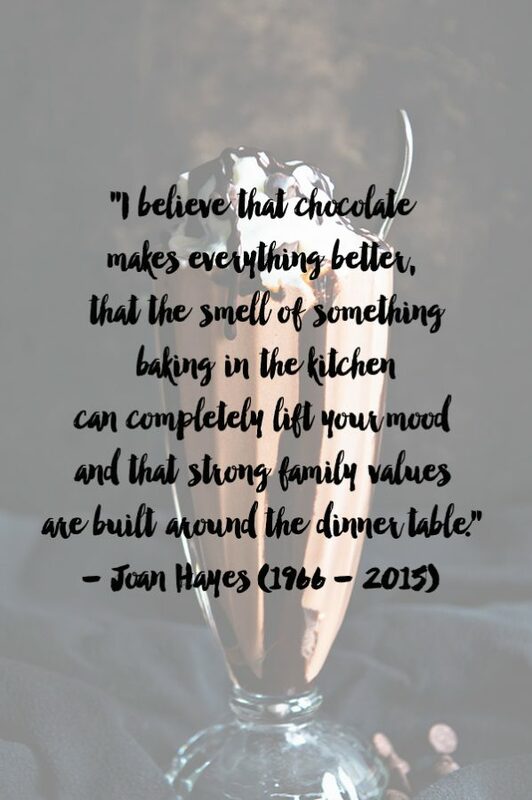 You’ll find chocolate recipes galore, and heartfelt words about our friend. Please visit Mary’s blog to check that out. Also, for chocolate recipes and more sweet treats, please continue to use Joan’s blog as a resource. She’s sadly left behind 3 children, and our hope is to keep her blog alive for her children. 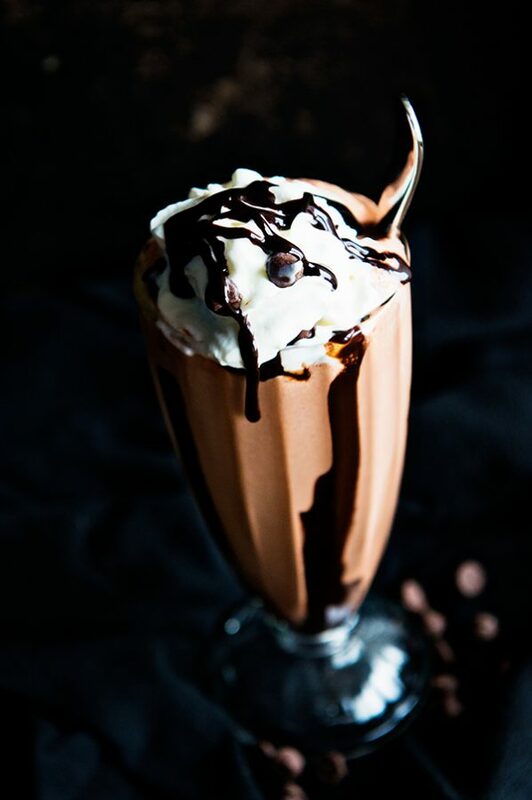 Now, to honor Joan, I am sharing a delicious, chocolate and booze filled milkshake recipe with my secret ingredient for added creaminess…instant pudding! Enjoy! A boozy chocolate milkshake with a secret ingredient that makes the creamiest shakes around! Place the ice cream, milk, pudding mix, and brandy into a blender and blend until smooth. 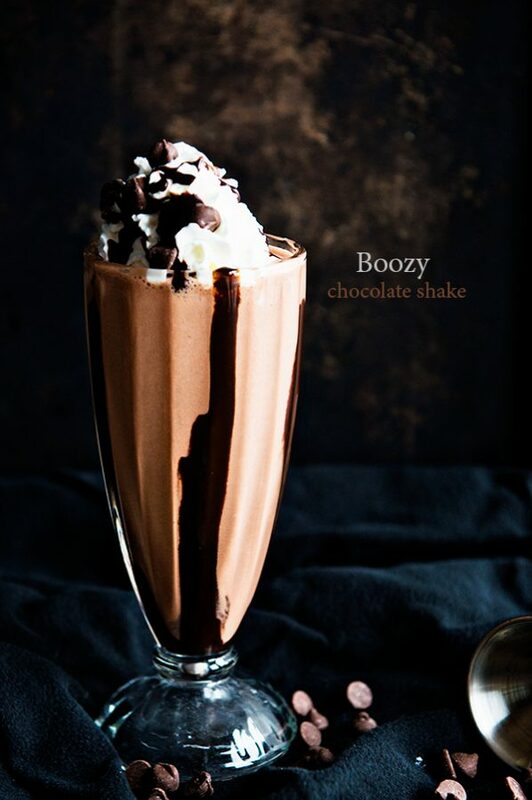 Pour into tall glasses and garnish with whipped cream, chocolate syrup and chocolate chips if desired! I’m crying all the tears all over again, Kristen. I wish you could have met her as well, but a real life hug, or an online bond, they are both every bit as strong. My world is better for knowing you and I know that Joan felt the same way. I love you, my friend. So many regrets…let’s meet soon, ok? Love you! Kristen, what a beautiful post. Joan had always spoken very highly of you and so looked forward to meeting you one day. These online friendships are pretty amazing and the support we’ve all shared this week is even more so. I so look forward to having that chance to meet you in person and I certainly hope it’s soon! What a beautiful post, Kristen. Joan was a true gem. I’m so glad that we can honor her and continue to spread her love of chocolate with the world. Sending you hugs. I’m so thankful we are friends. XO. I’m so very sorry for the loss of your friend Joan and send condolences both ro you and to her family. I never got to meet Joan but she was one of the most generous and kind friends online. I am so grateful to have met you and hope that we get to spend more time together! This milkshake is the perfect tribute to our sweet friend. Kristen . . . I know that this won’t help, but I really believe with all my heart that Joan wouldn’t want you to be full of regret. Whether or not you met in person, you knew Joan. I keep calling Joan this Mama Bear of the blogging community and I think that makes you it’s wise advisor. So kind to everyone, such a sweet peacekeeper. You and Joan were birds of a feather. It doesn’t matter that you didn’t meet her in person. Love this post. There are so many bloggers I’d love to meet someday and it’s pretty amazing to have met some and made real friends for life. 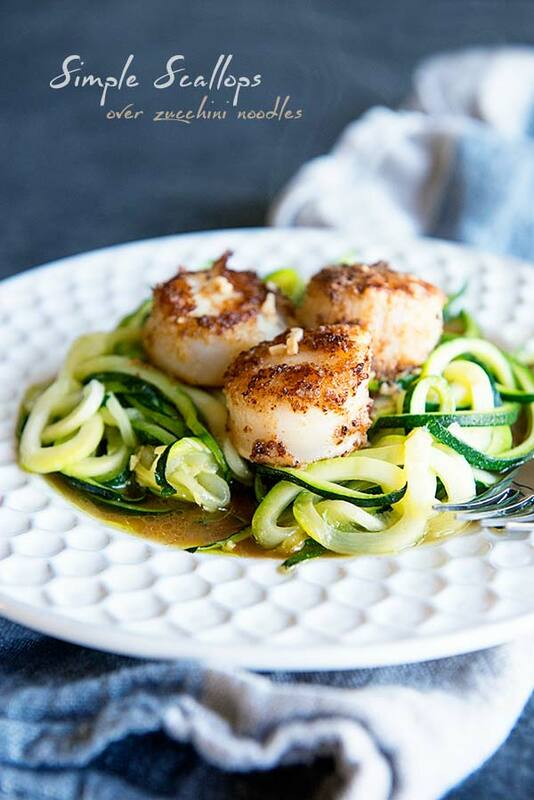 I did not know Joan at all, but loved her yummy blog (who wouldn’t/didn’t?) We need to meet next time I’m in KS. Such a hard thing, when people pass on so early. Oh Kristen… you have always been so good with words. I keep thinking about the fact that I was just weeks away from meeting Joan for the first time in Chicago. It really makes me sick to my stomach. I am so glad to have the blogging community to mourn together over this deep loss. Although I am not a blogger, I can attest that all of us followers build these relationships with you all. I followed Joan and enjoyed her so much. I recently lost a close friend to leukemia and the sadness is felt very deeply. My condolences to you all and her family. I am so saddened by Joan’s passing. I did not know her personally but I use her blog for recipes every week. I just made her chocolate ice cream with chips yesterday. All the children and adults in my family beg for me to make this. Thank you Joan, you will always be remembered in my family and in our hearts for countless hours of joy. This sounds absolutely amazing!! Here in North-Italy it’s really cold and windy so I’ll definitely try this! A beautiful tribute! I’ve had a hard time putting myself out there since I moved, but one reason I admire you is the way you try to make personal connections and encourage others to do the same. I’m blessed I got to meet Joan, but I wish we had been able to spend more time together. All these words are so true. I’m so thankful I got to spend so much time with her, which is crazy since we are on separate coasts! It just somehow worked out that way for us. This was a beautiful tribute. Hugs. First off, so sorry to hear about your friend. Secondly, I can’t wait to try this after lent, alcohol was one of the things I have given up and I am slowly starting to regret it now! JK! I can swap the liquor out with coffee to make it more of a mocha flavor and add some zing to it.